I didn’t know what to sew over the weekend. It isn’t like I don’t have plenty of projects on which to work. Also, I am making good progress on the Who Am I? piece, but I wanted to make progress. 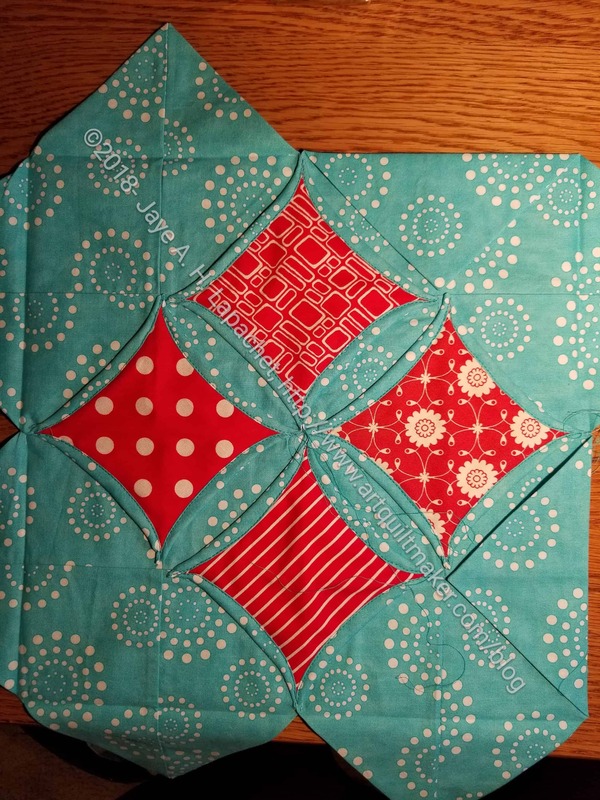 I have another block to make for the Aqua-Red Sampler and decided to try something new. I found some directions for a machine pieced (machine sewn?) Cathedral Window block and it was bugging me, so I decided it would be the last block in my Aqua-Red Sampler. It wouldn’t be the same as all the other sampler quilts and I would get to finish something today while progressing on something else. I started with the Fons & Porter directions I found in one of their magazines. 🙁 These directions did not tell me what size blocks I was making or what size to cut the patches. The directions were not that helpful either. I am not sure what the company that owns Fons & Porter is doing, but they aren’t doing themselves any favors by hiding this crucial information. I went to the web and found two tutorials. I used them in conjunction with each other, because neither had all the information. Sometimes Crafter had the right size, so I could tell what sizes to cut and Lovely Little Handmades had excellent directions though used different sizes patches. My block is still in process, but it is coming along very well. I have some hand sewing to do, which neither tutorial recommends, but I don’t care. It is the way I want to finish my block. I decided to create a tutorial. I think the quilt world needs a more complete Cathedral Windows block tutorial in the 12.5 inch (unfinished) size, so look for that soon. 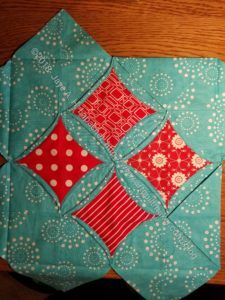 When I finish this block, another decision will be made and I will be able to put the Aqua-Red Sampler together. I love working on my Cathedral Windows Quilt. I don’t know if I can find the tutorial for it as I started this one over ten years ago I think. It looks very similar to the website you shared though. I like that once done, it is done. No batting or extra quilting needed. One thing that may surprise you is how heavy this quilt gets! I find mine is heavier than any of my batted quilts. I am doing mine mostly by hand too. I don’t do as many steps as your shows but I think yours will end up more crisp than mine. Looking forward to see where you go with this one!